Service Costs > How Much Does the Altitude Trampoline Park Cost? How Much Does the Altitude Trampoline Park Cost? The Altitude Trampoline Park is an indoor park and trampoline center. It offers an indoor playground for teens, kids, and adults with over 15,000 square feet of continuous trampolines, foam pits, and a rock climbing wall. On average, the single jumper rate for a one-hour pass is about $12 to $15, while a two-hour pass is $21 and a three-hour pass is $27. Each additional hour can be about half of this rate. These are the prices for those older than six. The cost will greatly depend on the location and the age of the jumper. Children under two are often free at most locations and children three to six pay closer to $11 for the first hour. For example, this Arkansas location lists its prices on the official website. A one-hour pass is $16, while a two-hour pass is $21. Children two and under are free, and children younger than three are $11 for an hour. Altitude Trampoline Park is a franchise of trampoline parks offering one of the biggest trampoline parks measuring more than 30,000 square feet with over 200 inter-connected wall to wall trampolines covering about 15,000 square feet as well as other attractions. This indoor park includes a range of specific activities such as basketball dunking lanes, 3D dodgeball, a kid zone, gymnastics tumble tracks, foam pits and a large main court. Altitude Trampoline Park also offers a rock climbing wall as well as a battle beam suspended over the foam pits for extra entertainment. In addition, families can organize special trampoline park birthday parties at Altitude Trampoline Park. Parties can be customized and include pizza and a private room, as well as access to the entire park for two hours for up to 20 jumpers. Trampoline socks are required to jump and will cost about $2 per pair. Altitude Trampoline Park also offers fitness class boot camps for $9.95 for a single class and $89.95 for a 12 class pass. There are competitive jumping classes and competitions, and most will have an entry fee. The park is open to those of all ages. To save time, the park highly recommends you purchase a pass on their official website to save time and secure a spot. Anyone younger than 19 will need to have a waiver signed by their parent or guardian. There is an open jump where guests get to jump as high as they would like on one of the numerous trampolines, in addition to fitness classes and Kids Zone for kids that weigh less than 80 pounds. And in case you are into the team sports, you should join in a fun game of trampoline basketball or even dodgeball on one of the two fully-enclosed dodgeball courts. You can order tickets online and fill out a waiver. The park recommends that you print out the waiver before you go to the park to save time in line. All guests over 18 must fill out and sign the waiver, and children under 18 must have one signed by a parent or legal guardian. 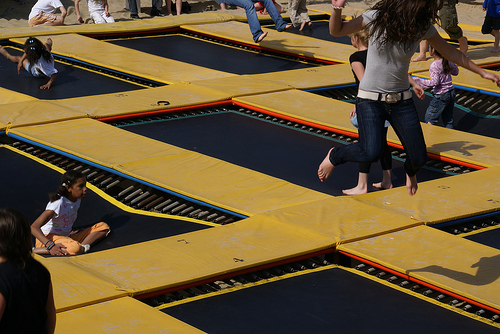 No shoes and any sharp objects are permitted on the trampolines, but socks are required. Altitude Trampoline Park can provide socks for a small fee to those who do not have any. Be sure to check out Groupon.com as the franchise does advertise on this daily deal website from time to time. Before going to the park, check the official calendar for discount days and special events. There are certain nights that have discounts for particular groups, for example (toddlers, pre-teens, and teens). There are also early bird specials and family fun packs that can save you money as well. Altitude Trampoline Park coupons can often be found on their website or in a local circular in the mail if you live near one.